Redbone Coonhounds are a medium sized dog with adult males measuring 22 to 27 inches at the shoulder and adult females at 21 to 25 inches. Weight is normally 55-70lbs for a male and 45-55lbs for a female. They should be athletic in build and their weight proportionate to their height and skeletal structure. Some lines are more muscular and 'beefy' while other lines are more agile and streamlined in appearance. Both are correct. Ears should reach the tip of the nose when brought forward, preferably an inch beyond. Feet are ideally 'cat-like' in appearance. Being splay-footed is not at all desirable in any coonhound. White on the chest or feet is acceptable. I also have a line of redbones who show a few stray white hairs in the genital area but other white areas should not be found on a purebred redbone coonhound. 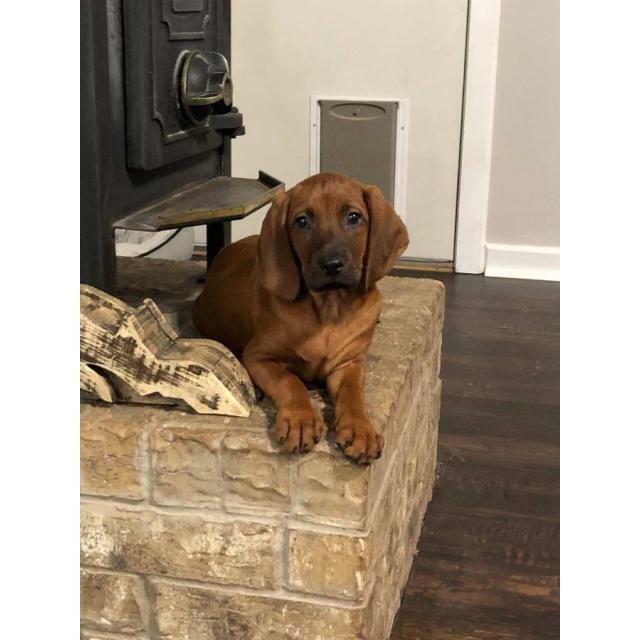 redbone coonhound femaleThe question I am asked most often is -- are redbone coonhounds easy to train? The question is yes, they are! That may surprise many people as coonhounds regularly get eye-rolls from dog trainers when signing up for class. They falsely perceive them as stubborn, easily distracted or just plain lazy. Redbones are none of those things. The problem with training coonhounds is also their best attribute - their nose! Redbone coonhounds have a terrific sense of smell and they very much enjoy tracking all things that smell interesting to them. 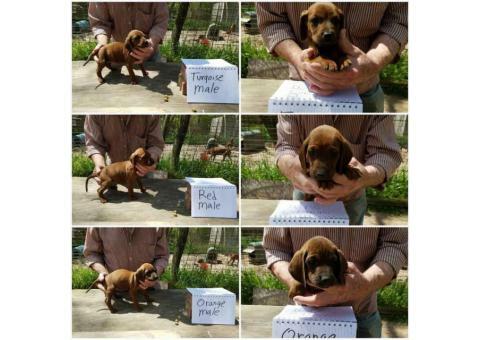 Understanding coonhounds is the trick to training them. There is one secret phrase that sums up this issue. When the nose is open, the ears are shut. 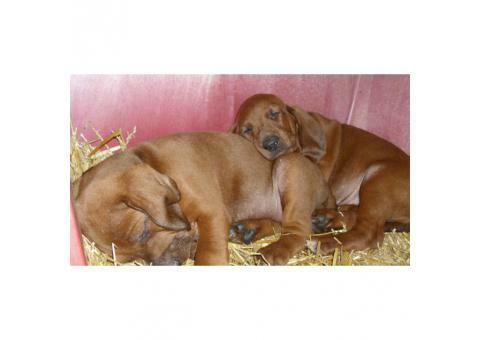 Redbone coonhounds simply can not use their nose and listen to training commands at the same time. When their nose is working, they quite literally do NOT hear you! They are not ignoring you. They are not being stubborn. They are not being lazy or blowing you off. They CAN NOT HEAR YOU! I've seen proof of this with countless coonhounds (of all variety of coonhounds by the way) over the years. That look of utter surprise on their faces once they realize you were asking something of them convinces me they did not hear you before that point. Once this is remembered, you plan your training around it. Get your coonhound's attention and give the command. Coonhounds are incredibly eager to please. They want you to be happy with them. I don't even use food rewards or clickers with them. Just knowing you are happy with them spurs them on to do their best for you. As with any dog, the secret is setting them up to succeed. For a redbone coonhound, that means making sure they aren't smelling something (on the ground or in the air) when you ask something of them. I have several redbone coonhounds of my breeding that went on to earn champion obedience titles as well as other fun titles in areas requiring intense obedience training such as agility. 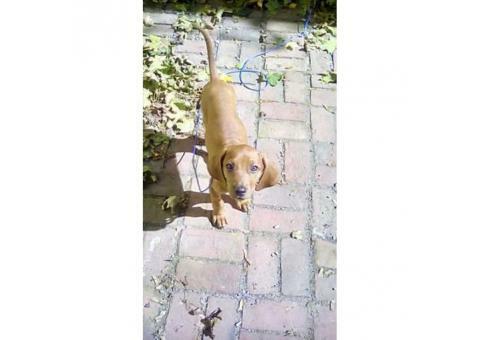 Temperament of redbone coonhounds should be friendly and eager to please. 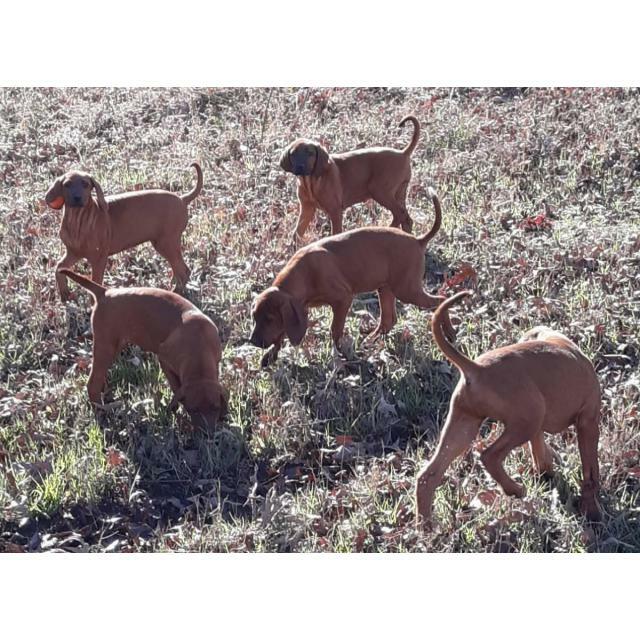 While bred to be superior hunting dogs, redbone coonhounds also make ideal companion pets, in the right home that can offer them room to run and an outlet for their energy. Redbone coonhounds were bred to hunt raccoons but that is not the only game they are adept at trailing and treeing. Being outstanding scent-hounds, they can hunt anything they can smell a track for. Commonly, this includes raccoons, squirrels, bobcat, bear, coyotes, cougar and even humans both in man-tracking (search and rescue and cadaver searches). 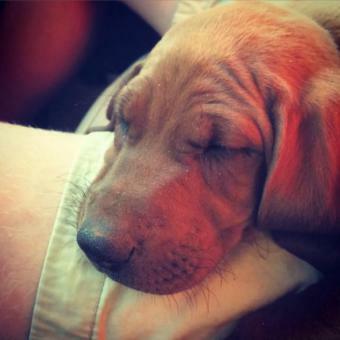 Several hunters have dual-purpose hunting redbone coonhounds. Hunting raccoons by night and squirrels by day is quite common. An interesting tidbit I learned as a breeder of these great dogs is that they are more versatile as hunters than I thought! 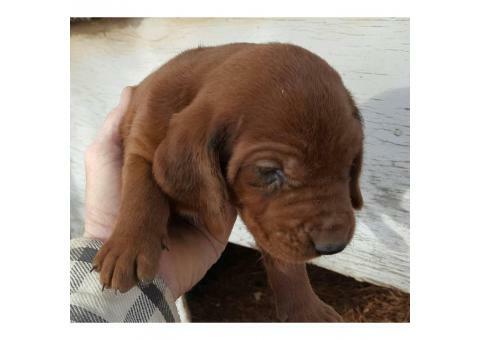 I once sold a redbone coonhound puppy to a very nice family who hunted ducks with their labrador retriever. While I told them redbone coonhounds love the water, I was confident they would be disappointed in thinking a redbone coonhound would hunt birds. I was wrong! This puppy grew to hunt ducks quite well, mimicking his labrador 'brother'. They didn't expect him to nor try to train him to do so. They simply wanted him to go along for the fun of being included. When hunting big game such as bear, cougar or wild boars, it is advisable to hunt in packs. 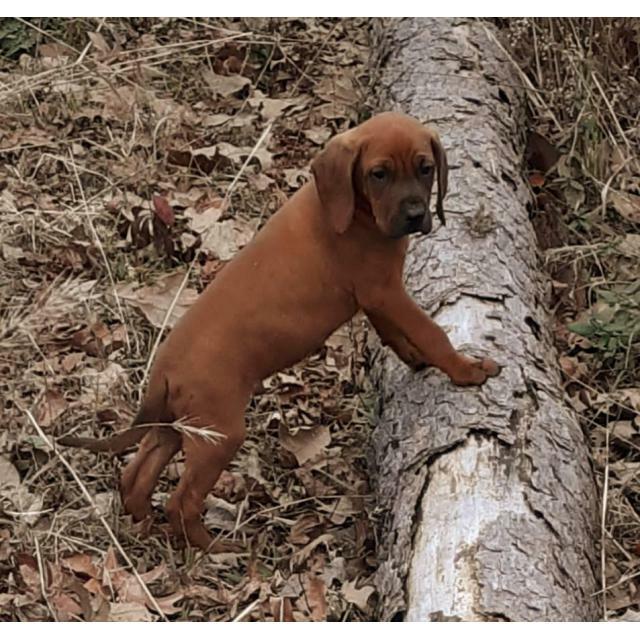 Redbone coonhounds aren't hunting to kill, but rather, to track and 'tree' their quarry so the hunter can either shot the prey or decide to leave them alone and move on to the next track. In licensed hunt trials it is against the rules to even have a loaded gun in your vehicle on the grounds let alone hunt with it. Some of these hunts offer huge cash prizes or big ticket items like brand new pickup trucks. Knowing this, it's not surprising to learn just tracking and treeing without ever harming the hunted animal is fairly common though the meat and furs are quite desirable.